The Copper Range specificed that its units be painted in a scheme identical to that illustrated in the Baldwin's catalog. At least three other railroads used this paint scheme; The Seaboard Air Line, The Macon, Dublin & Savannah, and the Lehigh Valley, although color combinations were varied. Same view of #100 taken on the Copper Range in 1969. They were sold to the New Hope & Ivyland in 1974. George Barry was a volunteer on the NH&I and relates "The baldwins were always great, although I do not remember them ever being mu'ed, of course there was never much of a need on that line for that. Biggest problem I had was trying to stay awake at the end of a long day listening to the chant of the engine! 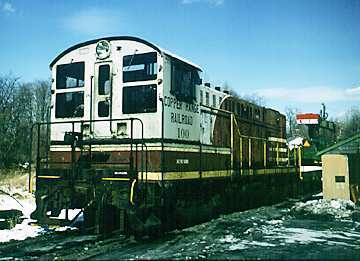 As far as the disposition goes- I think this is correct- Last picture I saw of 100 she was sitting in a siding kinda stripped in Langhorne, PA, near the McHugh Bros place. This was a few years ago. 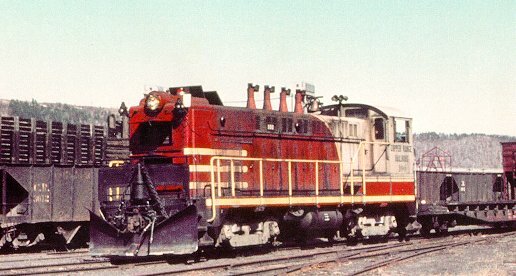 101 I understand was sold to a shortline over in Jersey somewhere that has a few other baldwin switchers. I do recall that 101 with a small freight was slammed into in the mid 70's by a cut of cars that got away from the Reading at Ivyland. The batteries had to be replaced and the wheels retrued, several crew were busted up." This is in regard to the Baldwin switchers after they left the COPR. #100 was last seen in a push/pull shuttle from New Hope to the RDG. commuter line to Philly during the 1976 bicentennial. It was hauling an ex-Reading coach with the pantograph still on, but down! the 100 was still in its COPR paint scheme! #101 was repainted in fall,1974 in a gree,red and yellow lettering. It went through a modified green paintover a few years ago, with a SMS logo. the M being for McHugh owner of the New Hope line. Renumbered 1293, it is currently serving an industrial and warehouse district, just outside Camden, N.J., with a couple other old Bsldwins ofvarious vintage. 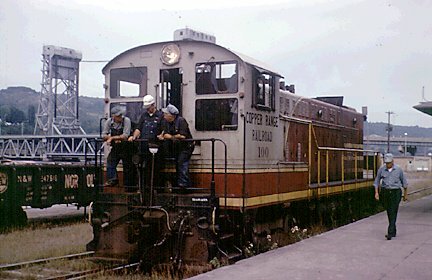 #200, the S-12, served for many years as the plant switcher at the White Pine Mine, the last bastion of theCopperRange mining empire. It was retired about1995-6. 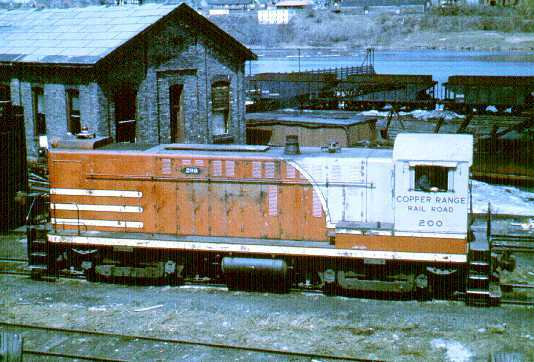 The leased SW-1.200 was last reported and seen on a siding at Mellen, Wis., in a simplified maroon and gray paint scheme , took many photos! This was accompanied by an ex-LS&IRR RS-2/3 used on the short-lived Wisconsin and Michigan RR, that ran on the former SOO LINE branch from mellen to Ironwood/Bessemer, Mich.
Ex Copper Range #101 still getting to see some snow on the SMS-Penn Jersey Rail Lines today. See more photos of 101 here at their website.